Rapper dumbfoundead shows his acting chops in the upcoming webseries “Run DMZ”. When a new Korean BBQ spot (Ken Jong’s Grill) opens up across the street from his mom’s restaurant, old tensions between North and South Koreatown boil over and Jon Park (Dumbfoundead) must take matters into his own hands to hold down the neighborhood. It’s time for Jon to take back the DMZ. The six episodes webseries was written by dumbfoundead with cameos by Danny Cho, Randall Park, and a bunch of his friends. 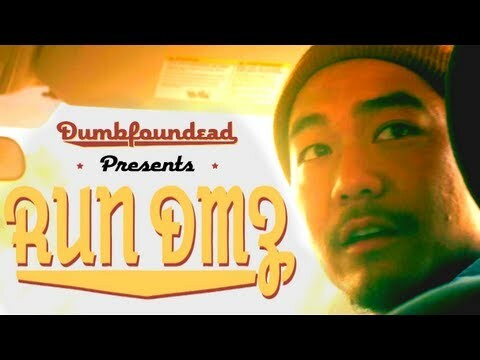 Best of all, you’ll hear some dope music in the series from dumbfoundead and friends. Listen to more dumbfoundead: Huell Howser, Born For This, Old Boy Jon. 10 Rounds, New Chick, Growing Young, Korean Jesus, K-Town Girl, You Know How We Do, COTDAMN, Cellphone ,Cool and Calm, For You, BRB, Are We There Yet?, and Love is a Song (DFD Remix). This entry was posted in comedy, shorts on June 1, 2013 by Kevin Hsieh - channel APA.